Norway is a country located in the northern part of the continent of Europe. Ever since the 14th century, Norwegian flags have been hoisted on different objects and have reflected historic events specific to Norway. Today, this flag is hoisted patriotically on Norwegian flagpoles. 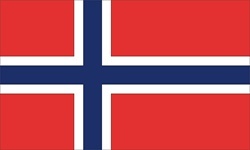 Visit the Norwegian flags product page.